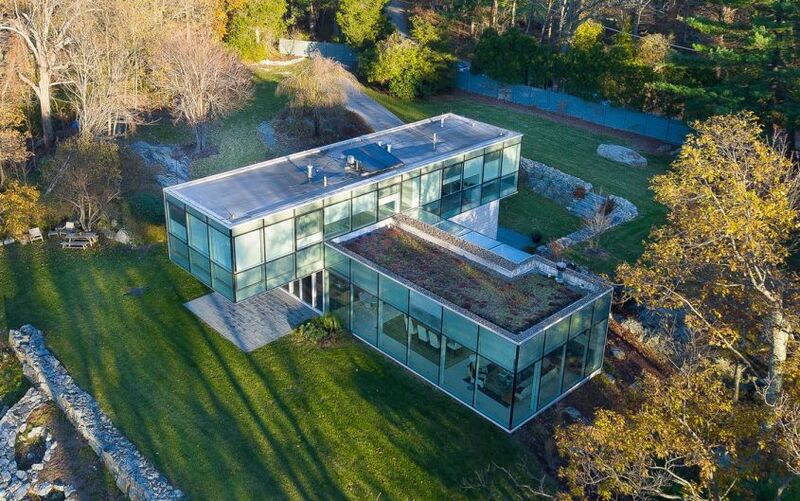 Glass houses are one of the most wonderful architectures that boast unique aesthetics and functionality. 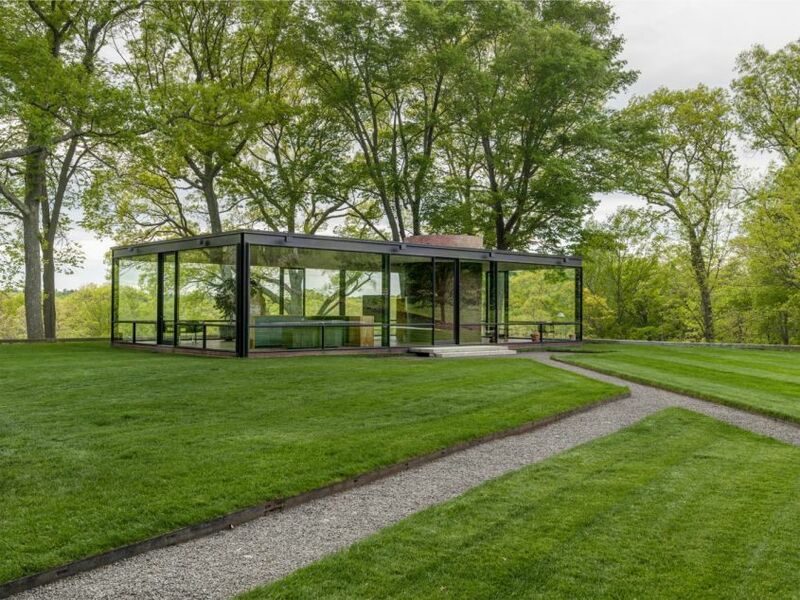 The glass house architecture dates back to 1940s-50s when Philip Johnson and Mies Van der Rohe created some cool glass structures that had transparent appeal. 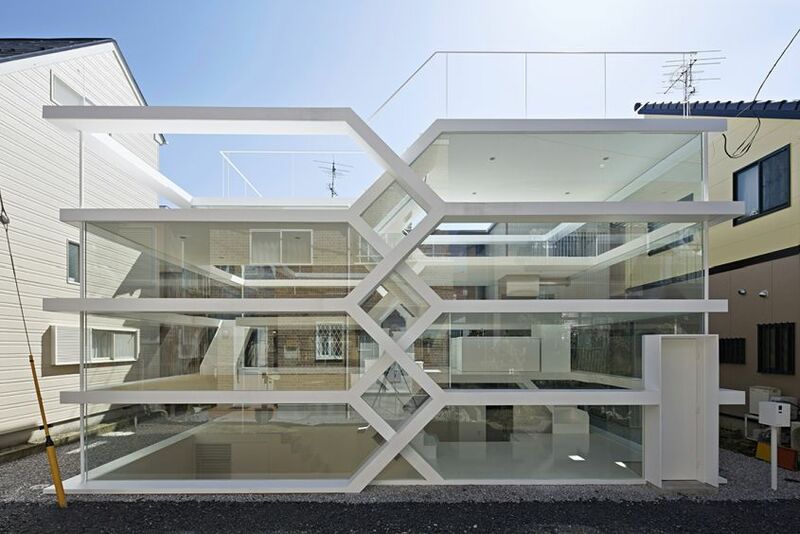 Although, facade and walls use glass as the main building material, internal partitions and floors bolstered by strong frames provide the required structural stability. 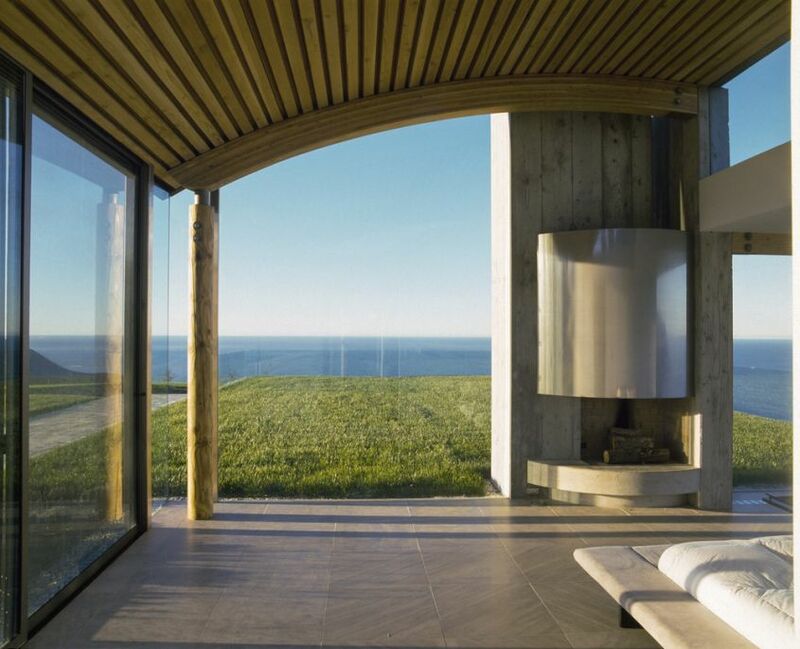 The transparent walls bring loads of natural light and beautiful views in, providing a deep connection with nature. Privacy may be one of the concerns with such architectures but the one-way vision glasses and curtains take good care of it. 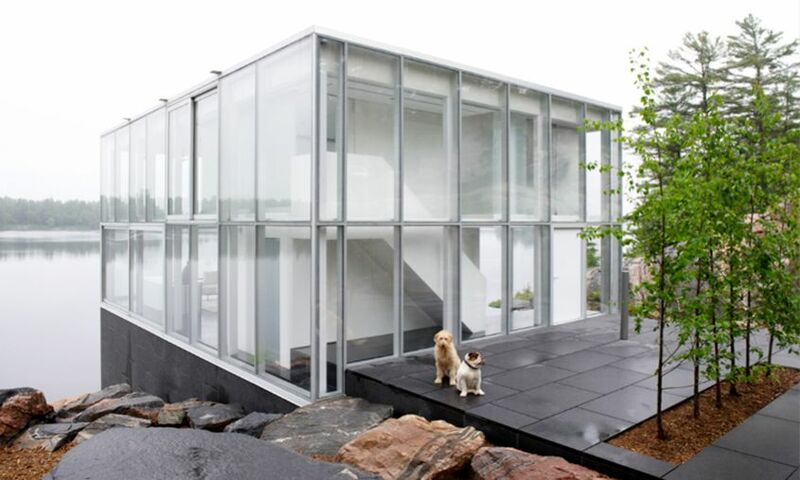 Glass houses are a good example of modern architecture that can be a small backyard cabin to a fully-furnished vacation home. 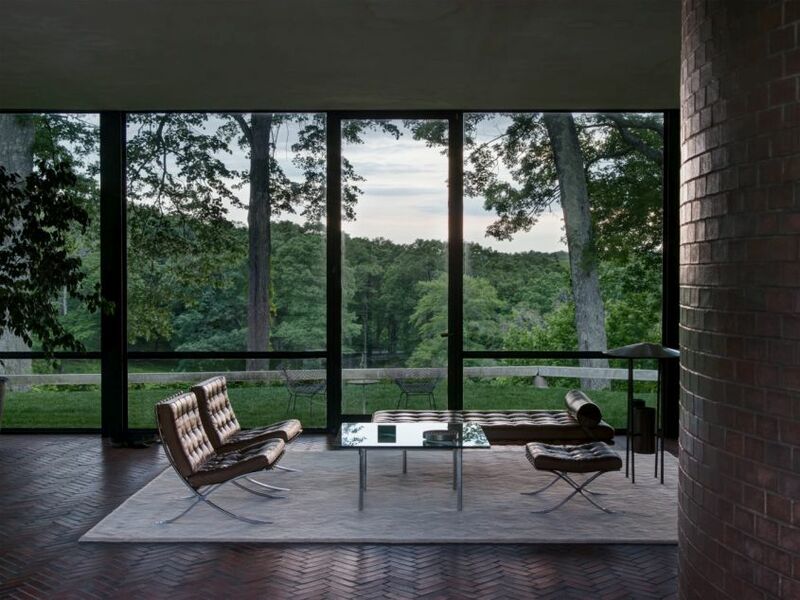 The real beauty lies in the connection between interior, exterior and the surrounding landscape. 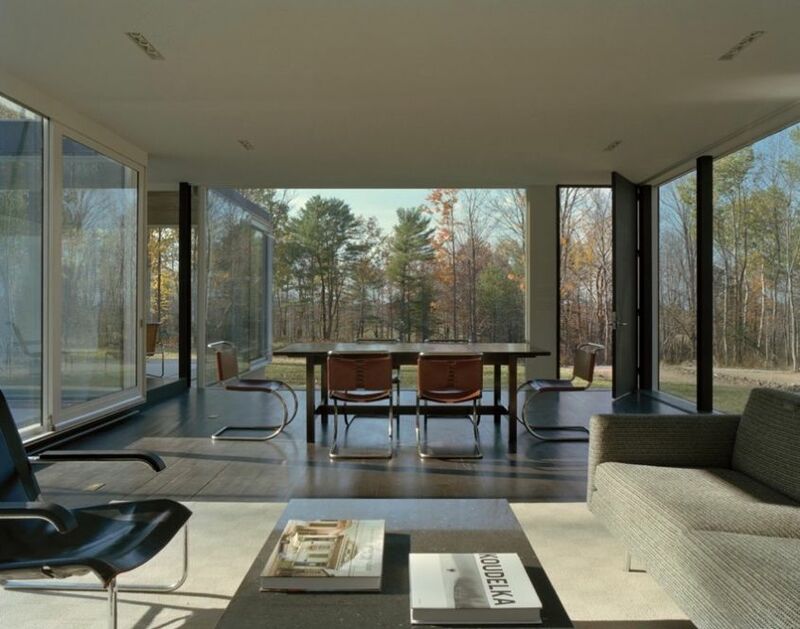 If you ever wished to live in harmony with nature, the modernist see-through homes are the best ways to enjoy comforts of indoors while being surrounded by the natural beauty of outdoors. 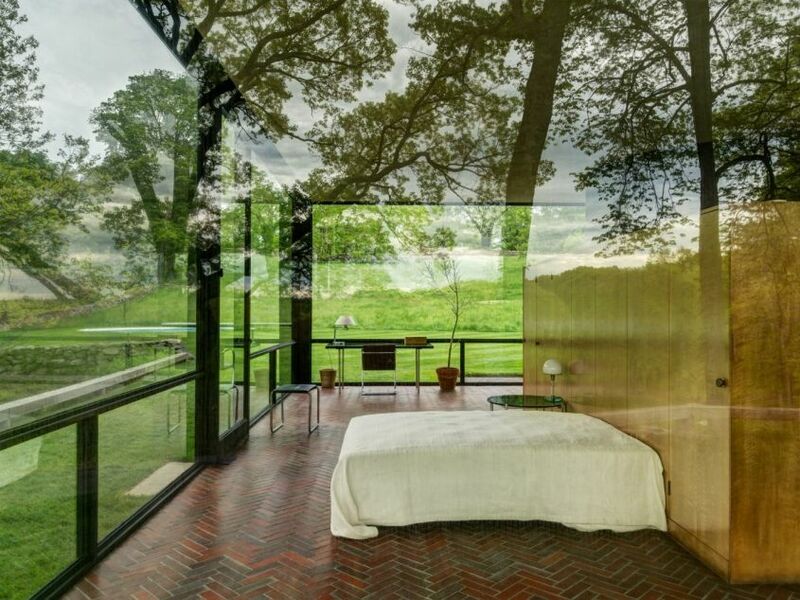 Here is a list of modern glass houses from around the world that offer mesmerizing views of surrounding landscape from the comfort of bed. 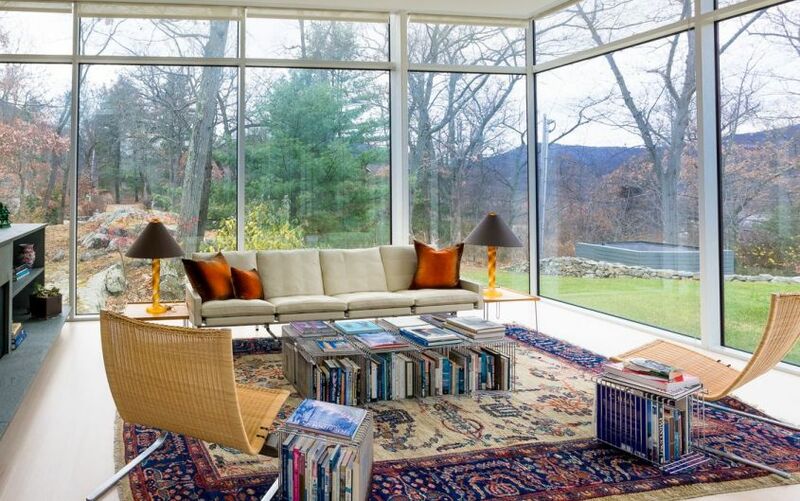 Designed by Philip Johnson in 1949, it is one of the most prominent pieces of modern architectures located in New Canaan, Connecticut. 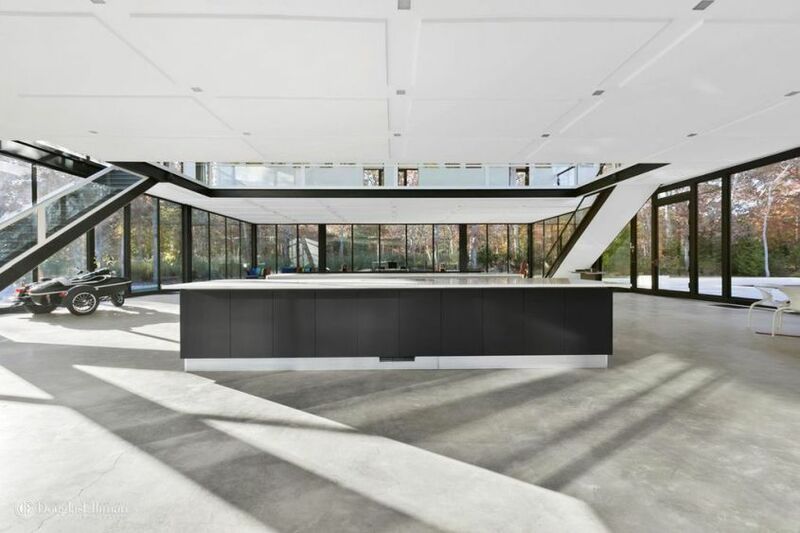 This one-story glass house features open floor plan and floor-to-ceiling glass walls between black steel piers and stock H-beams. There is a kitchen, dining room, living room, bedroom, hearth area, bathroom, and an open entrance area. It was declared a National Historic Landmark in 1997. 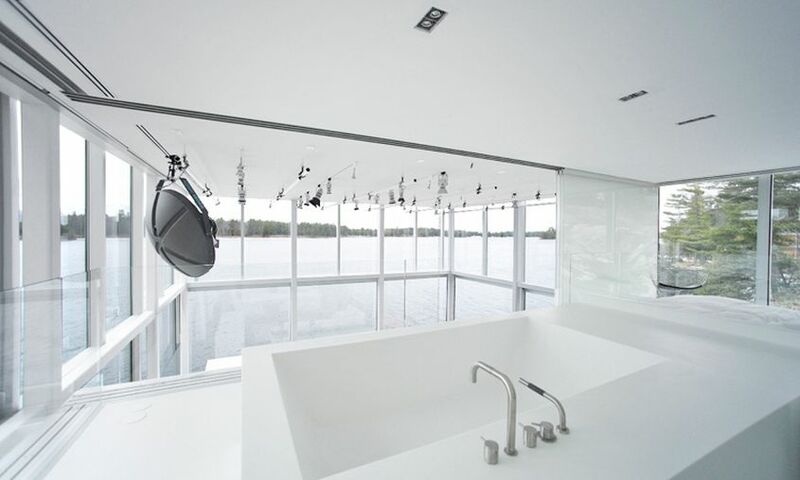 This 1,240 square-feet waterfront lodge featuring floor-to-ceiling glass walls was built across a lake near Montreal in 2015. The kitchen and living area are positioned on one side, and two bedrooms are housed on the other. The complete white interiors nicely match the polished concrete floor, while triple glazed windows help in climate control. There are large roof overhangs to provide shade and reduce the amount of rain hitting the exteriors walls. The glass pavilion is topped with a green roof, with edges covered in reflective aluminum panels. The roof is supported by thin, white-painted steel columns. 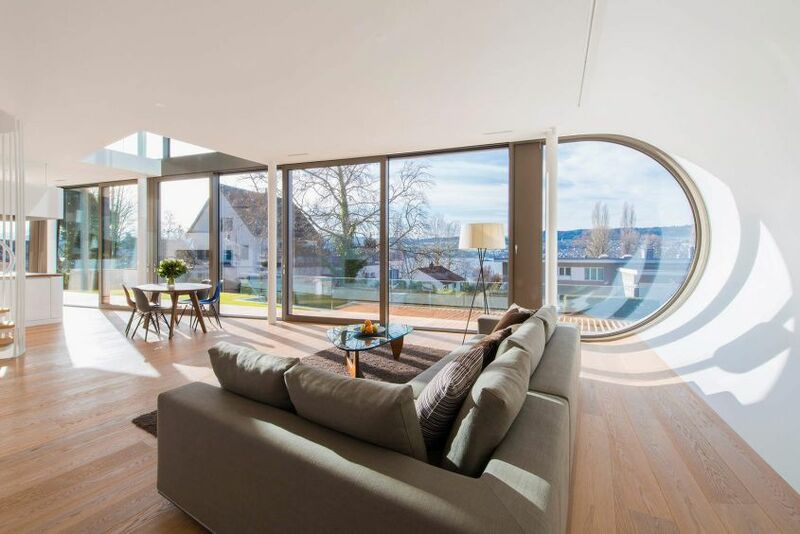 The curving copper roof over a transparent glass structure is what makes this house different from most glass houses. 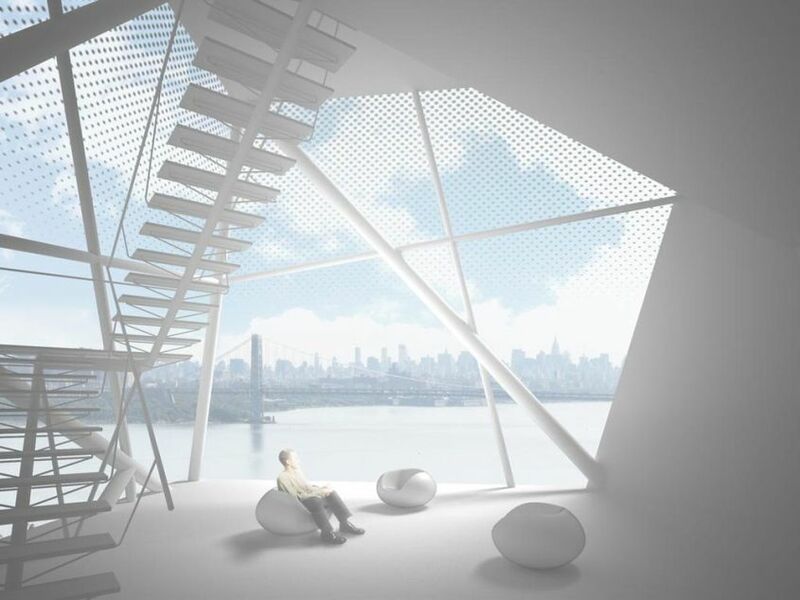 The glass facades reflect silhouettes of surrounding mountains, and maximize the viewing angle. 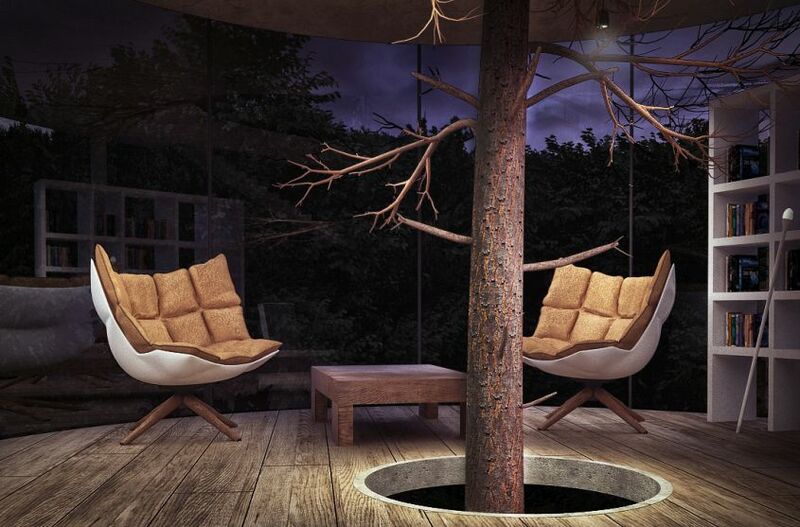 The creative use of wood in exterior and interior space makes it even more appealing. 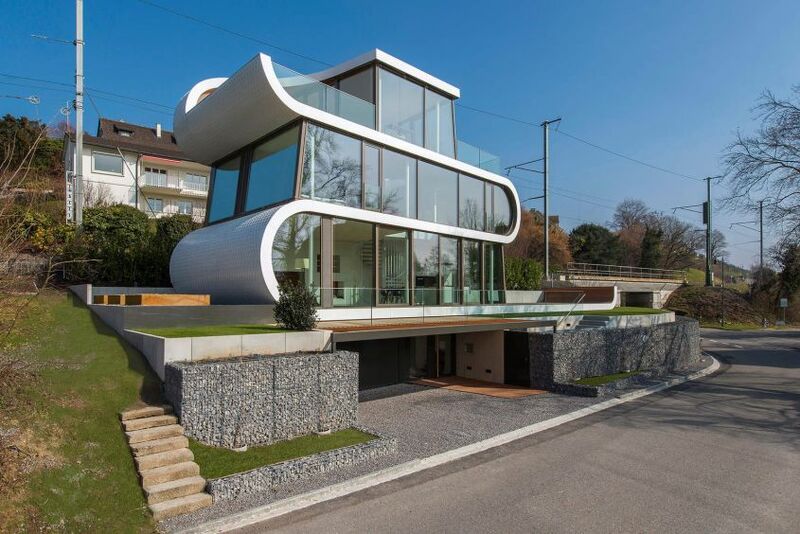 This four story, 173-square-meter waterfront home features a distinctive white glass façade that is enough to draw anyone’s attention. There’s an open kitchen-dining-living space on the ground floor, two bedrooms and bathrooms on the first floor, a studio with two large terraces on the second floor, and a garage and utility space in the basement. 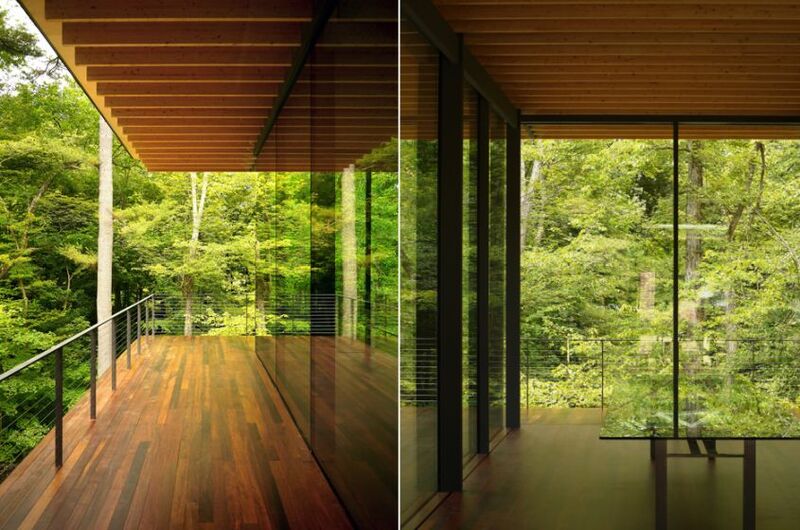 There are glass walls on three sides to blend into the surrounding foliage. 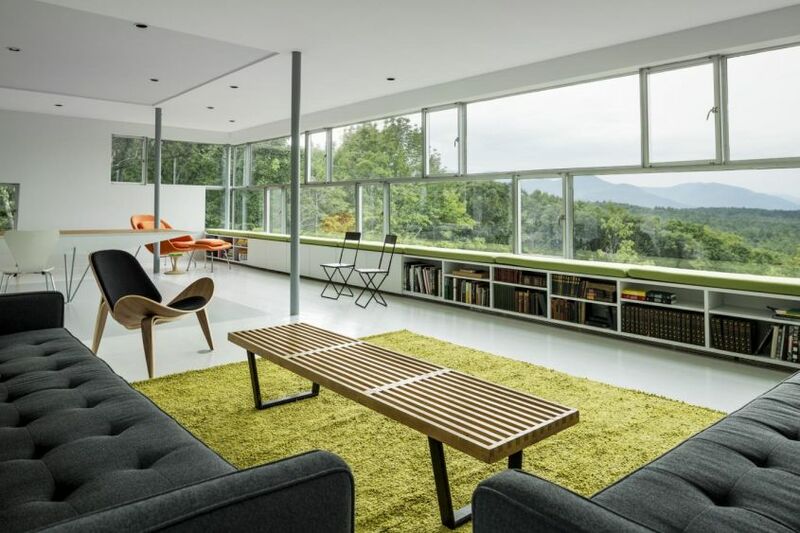 The focus of the design is to maximize outside views from all living spaces of the house. 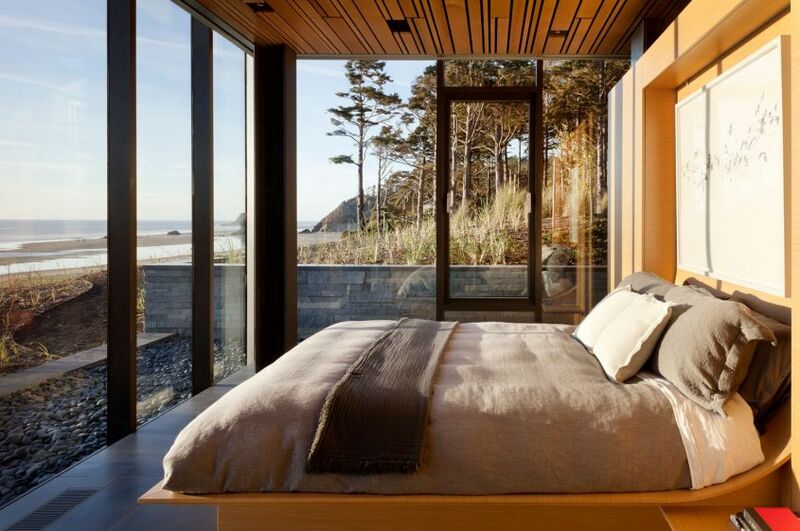 Built for a couple at the edge of Oregon’s coastal forest, this simple two-story, glass house serves as a weekend getaway to connect with the nature. 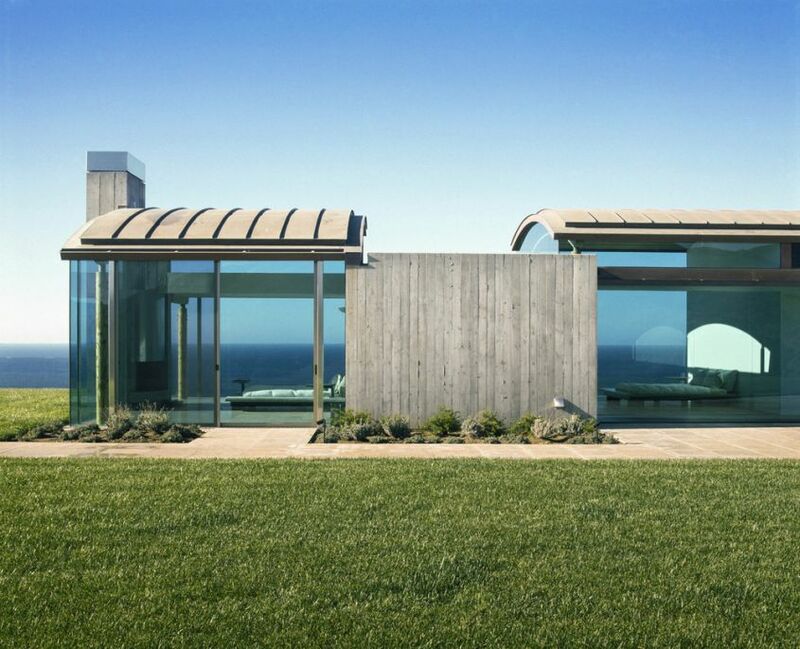 The 3,330-square-foot vacation home is capped with a green roof to blend with the surrounding landscape. It took almost six years from the purchase to completion of the home. 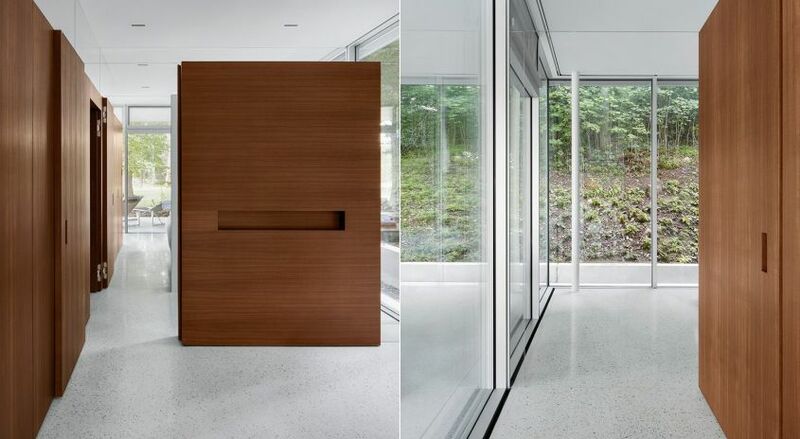 The choice for the palette of materials is limited to glass, metal, wood and other natural materials. 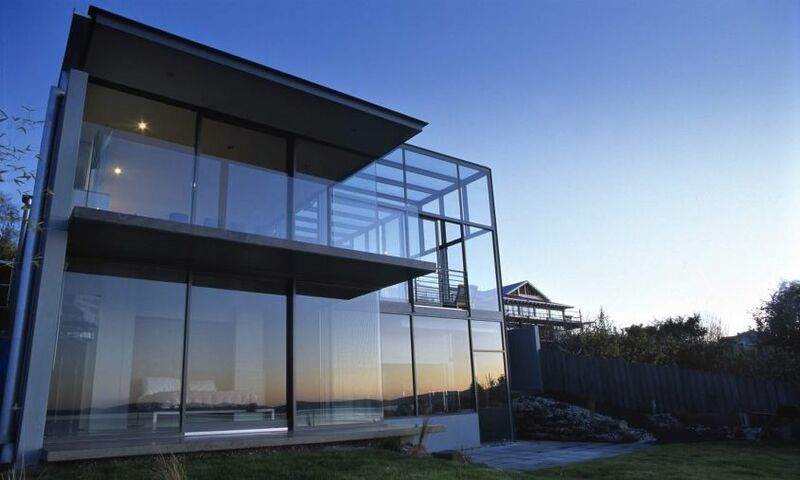 The glass curtain-wall system is an important and painstaking task in the design. 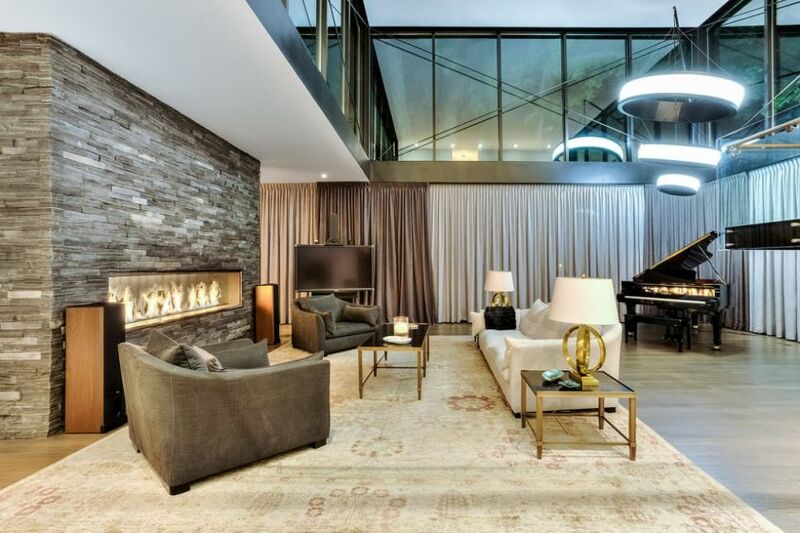 Located in a wooded location in Oakville, Canada, it is a three-story, modern glass house that combines luxury with natural in a marvelous way. It offers a total of 8,271 square-feet living space, with floor-to-ceiling glass walls, offering beautiful views of the surrounding area. The main level is designed with entertainment in mind. There are five bedrooms and a wine cellar tucked in the basement. 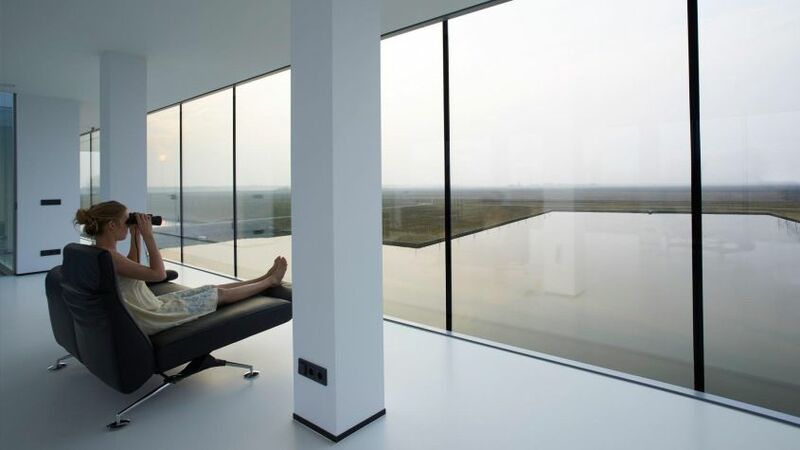 Netherlands-based architecture firm Hans van Heeswijk Architects has designed this glass house with the aim to bring in loads of natural light and outdoor views. It is a simple, rectangular building that consists of three floors and a basement. The facade on the street side is closed by perforated elements, while other glass-paneled sections offer expansive views of surrounding areas. 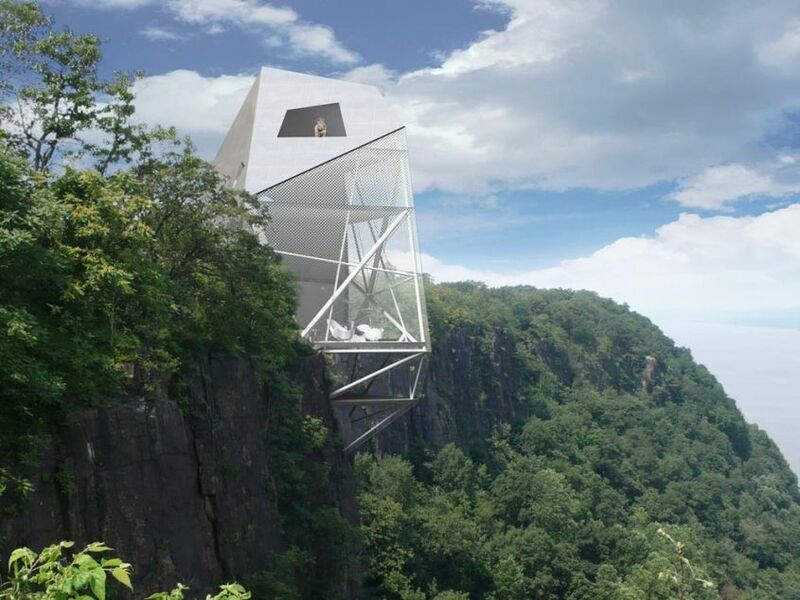 The Tower House is built by New York-based architectural firm Gluck+ in a woody location as vacation retreat to enjoy magnificent views of the Catskill mountain range. There are three floors joined through a central staircase. It employs an innovative ventilation technique to take on the temperature of living spaces. 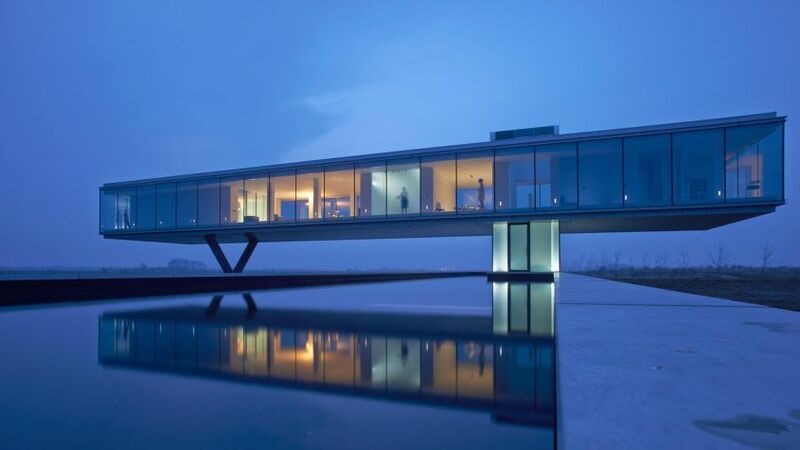 The unique cantilevered design lowers impact on the ground and makes the glassy structure different from others. This single-family home in Massif Central region in France consists of two units: a ground floor and a glazed upper story that levels against the ground and provides uninterrupted views of the landscape. 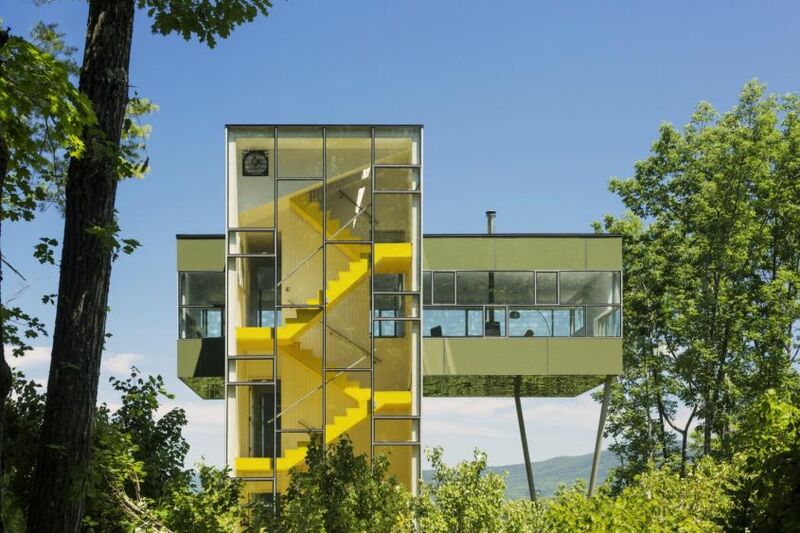 The living quarters, dining area and sleeping areas are housed on the transparent top floor of the house. 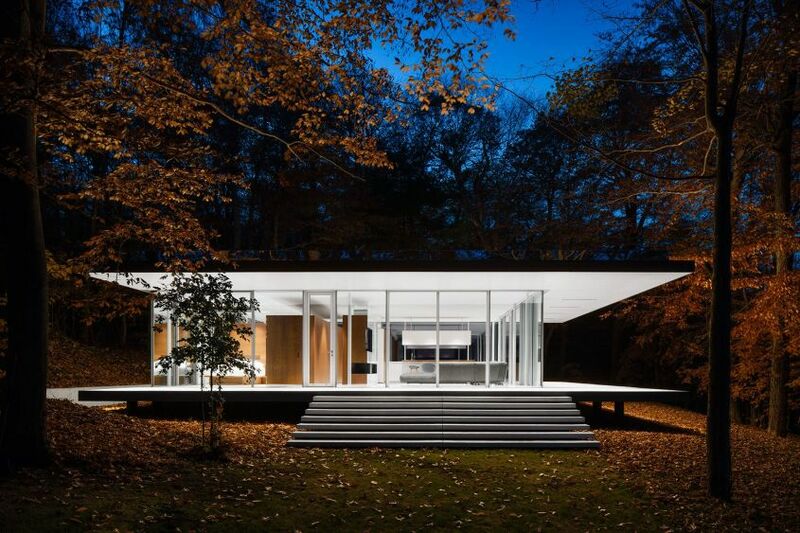 This cantilevered glass house is designed by Japanese architect and Harvard professor Toshiko Mori. There are four wings, each offering magnificent views in all directions. 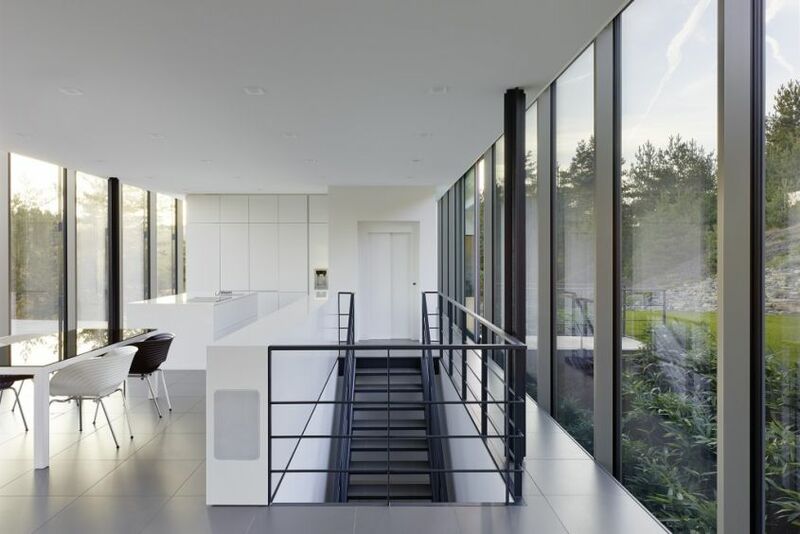 The floor-to-ceiling glass walls and bright white interior seamlessly blend with the surrounding environment. 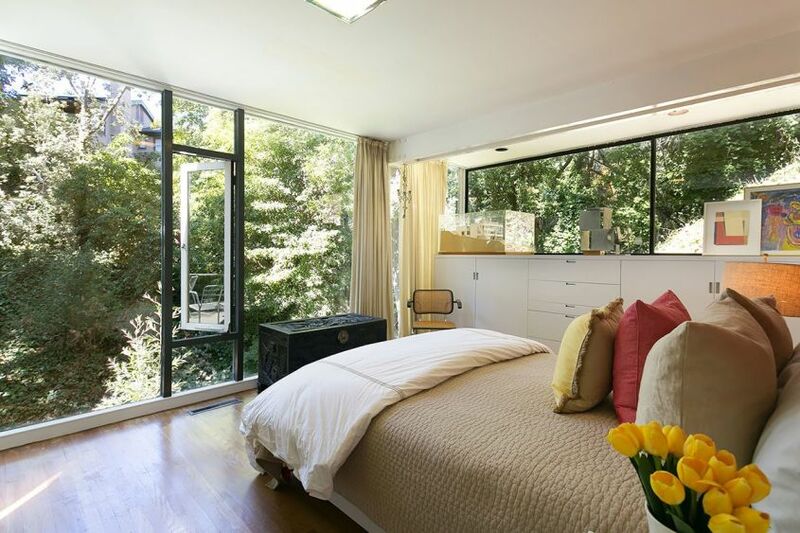 From the living room and bedroom to kitchen and dining area, all living spaces are bathed in natural light. There’s even a green roof to merge with natural settings of the location. 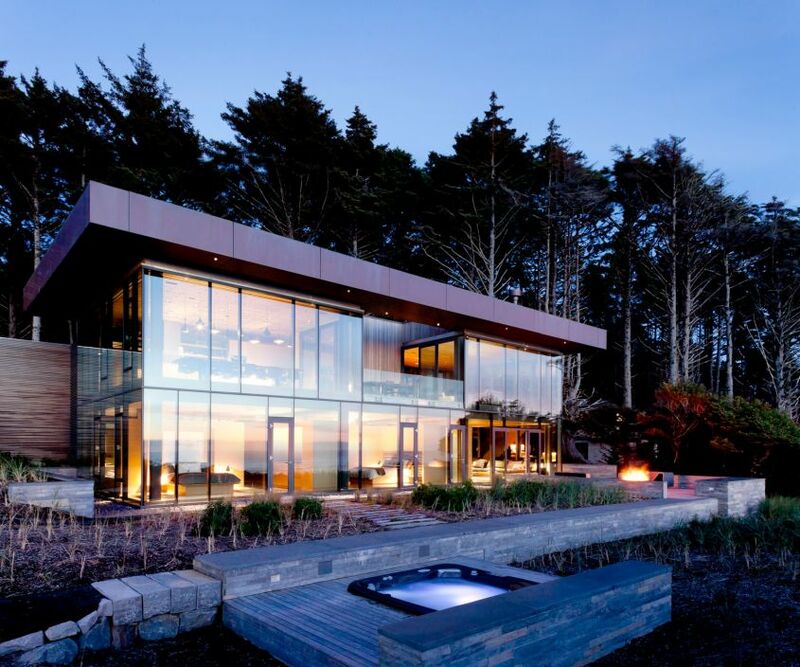 Designed by Toronto-based design studio GH3, this lakefront house blends into the surrounding landscape with simple and sophisticated see-through glass façade. 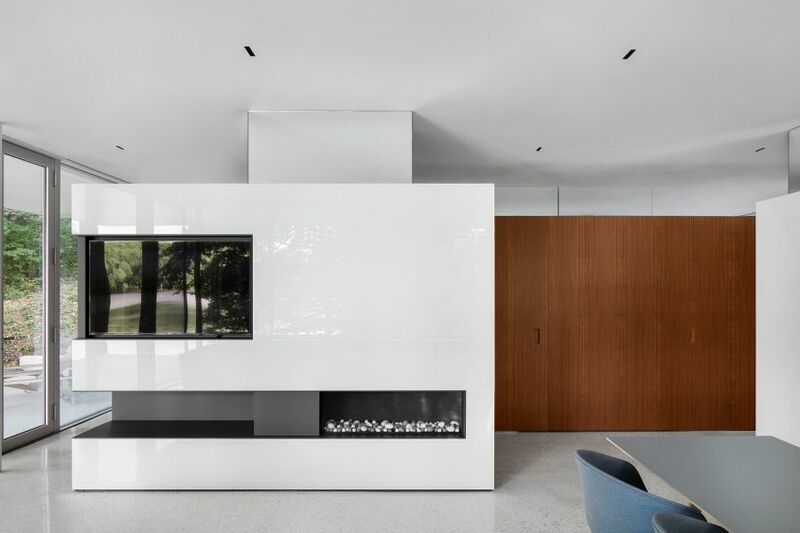 The complete white interiors complement the dark floor, adding a contemporary and stylish essence to the house. 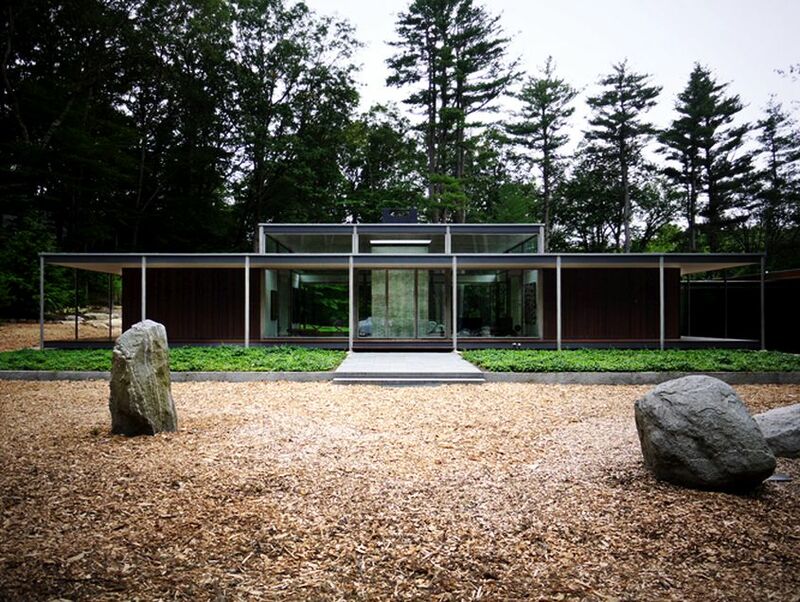 Also the use of glass, metal, and granite significantly improve its thermal efficiency. 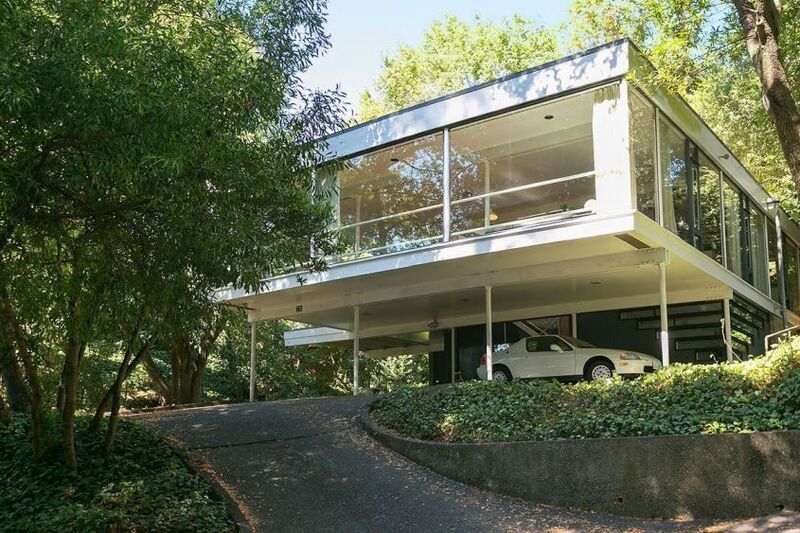 It is a great example of the international style architecture in the 1950s. 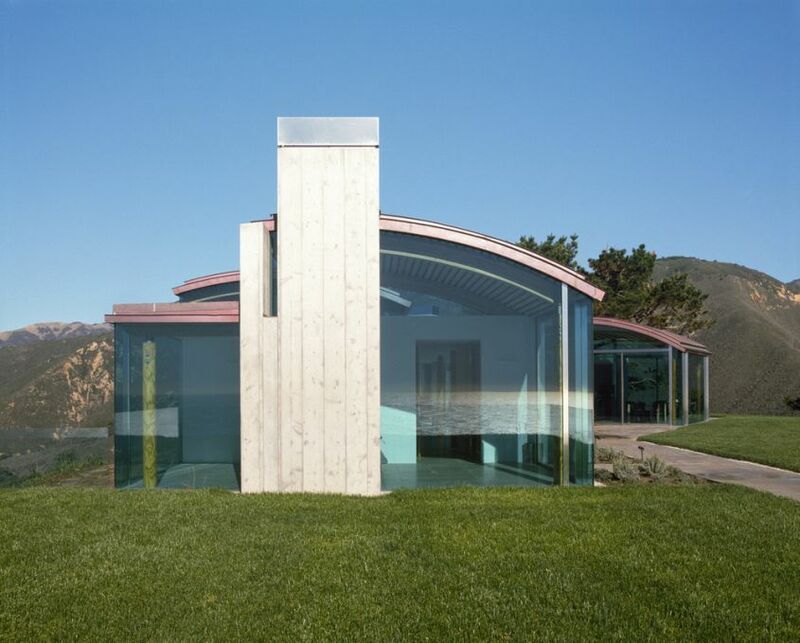 The transparent glass façade of the house built by Berkeley architect Donald Olsen helps it merge with outdoors. 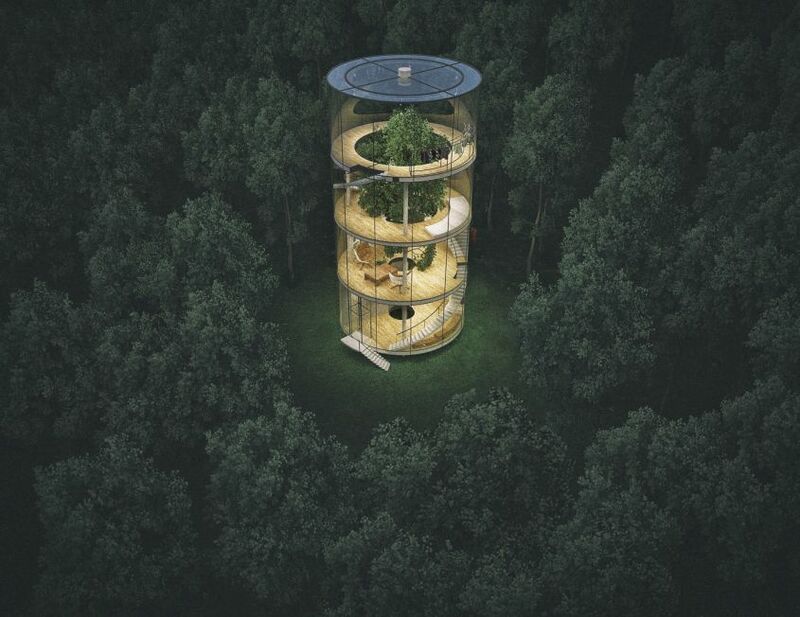 The raised upper floor helps its residents to stay connected to the nature. This fully glazed house is a collaborative project by Slovenia-based OFIS Architects, Guardian Glass engineers and energy consultants from AKT II and Transsolar. The triple glazed windows not only improve thermal and acoustic insulation but also make it a complete off-grid housing unit for two people. 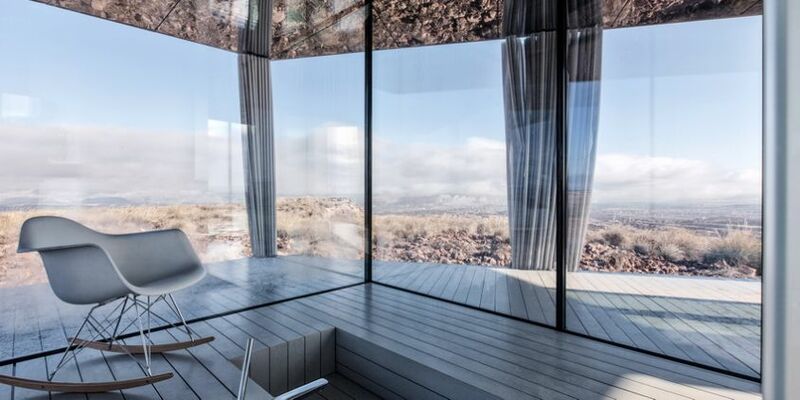 Located at The La Casa del Desierto (the desert house), it is designed to maintain a comfortable atmosphere even in extreme temperatures of deserts. 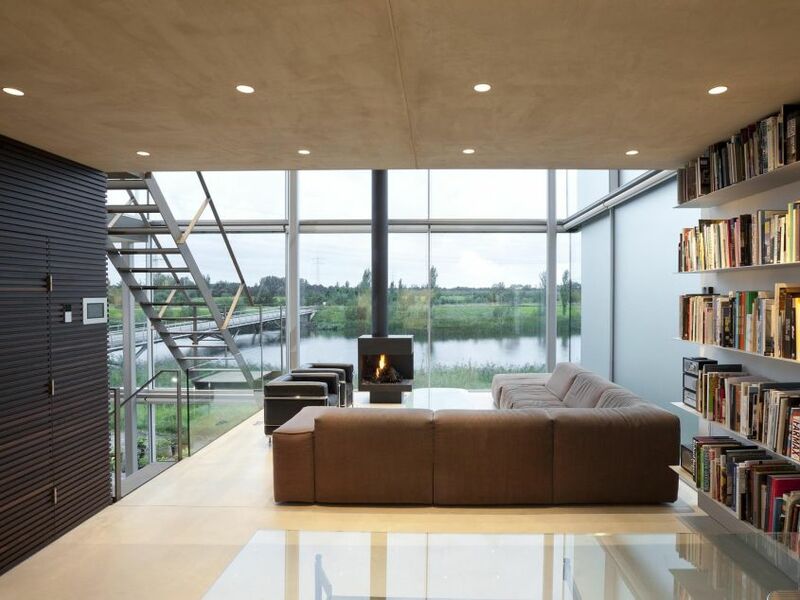 This eco-friendly villa consists of an underground volume and a glass house floating above the ground. 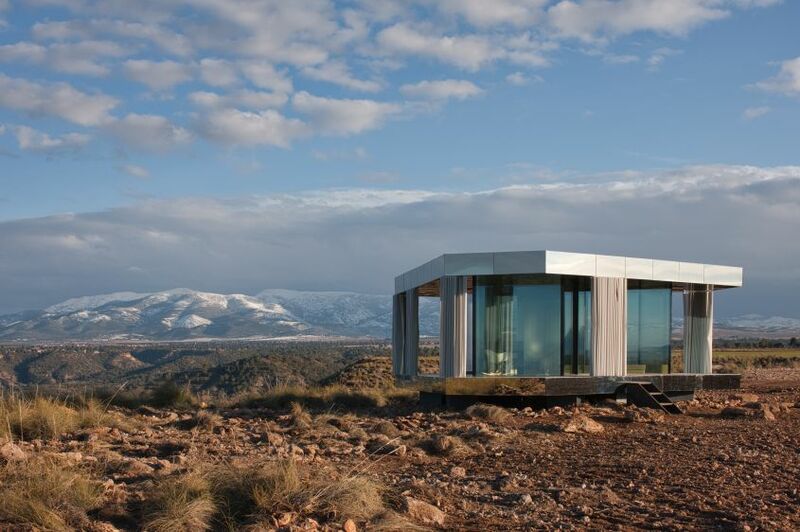 The villa generates its own energy and has a built-in cooling system. There’s also a water roof to illuminate the living areas underneath. 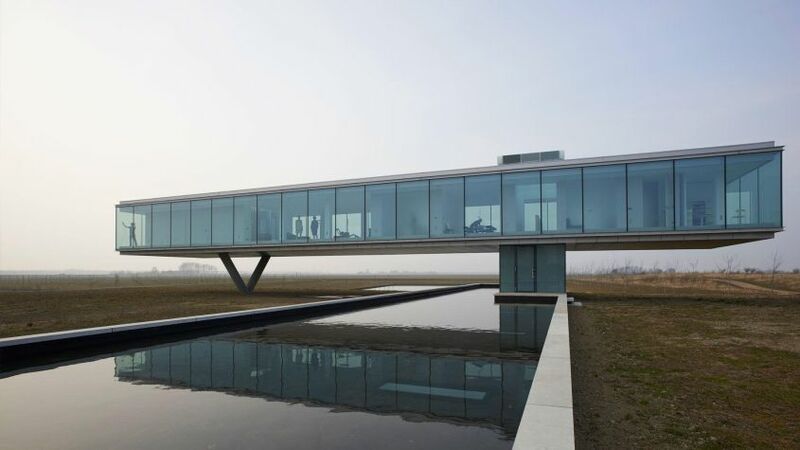 As a worthy feather in its cap, Villa Kogelhof has won the Dutch ARC13 Architecture Prize. 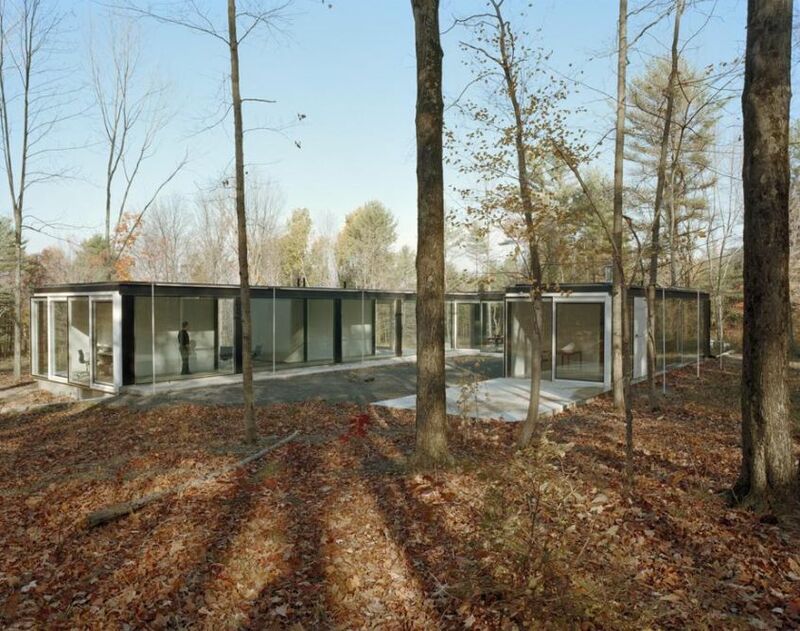 Located on a 1.9-acre property surrounded by woods, this see-through, glass architecture was built by Juan A. Figueroa. 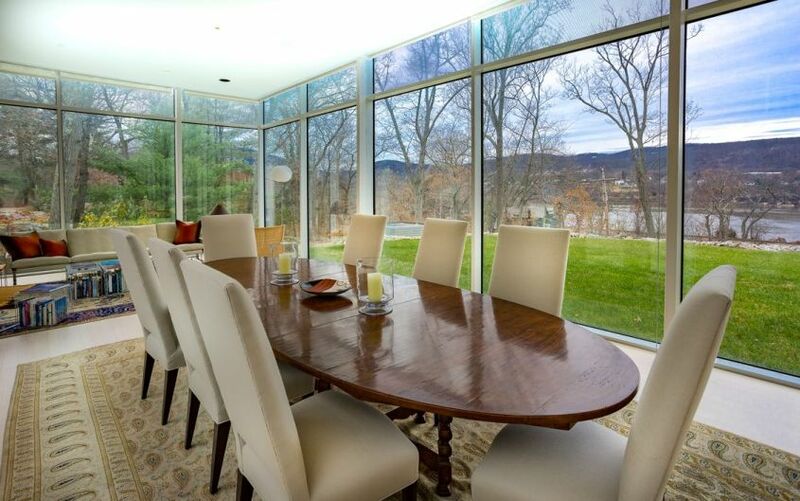 Whether its the living room and kitchen on the first floor or bedroom suites on the second floor, the floor-to-ceiling glass windows bring natural light and outdoors in. There are smart features too like front gates, lighting, heating and air conditioning system that can be controlled remotely with an iPhone. 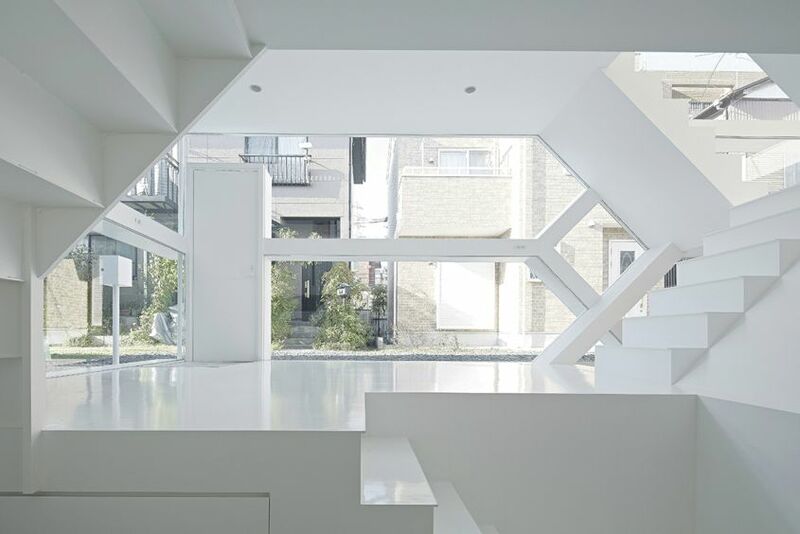 Tokyo-based Yuusuke Karasawa Architects has designed this glazed, two-story house that reflects its surroundings. 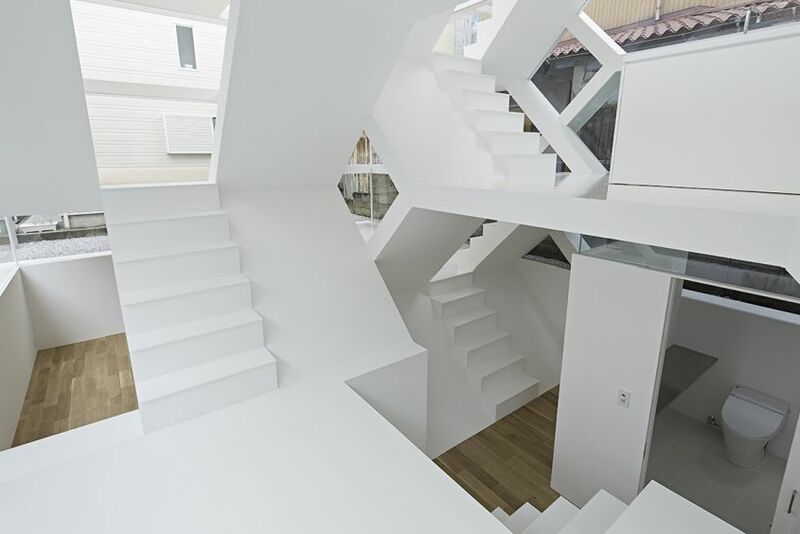 The house has zigzagging central staircases to connect the split levels. 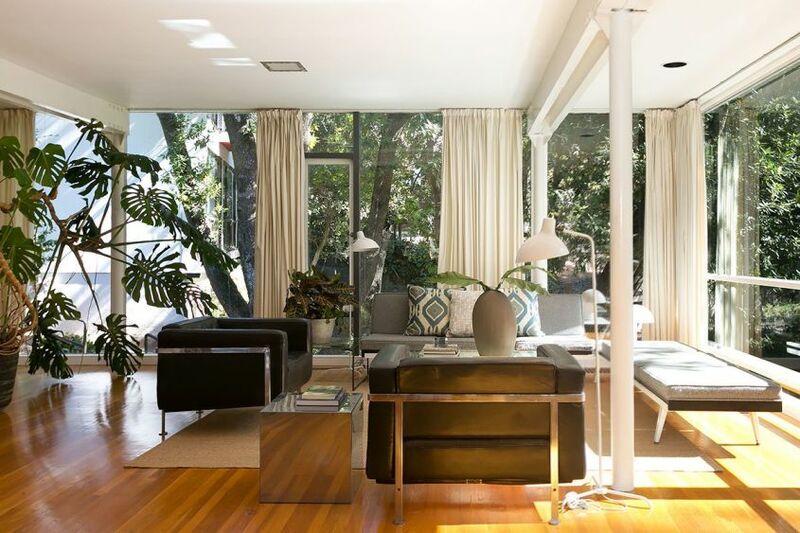 The complete white interior with large glass windows creates an ultimate luxurious environment inside. 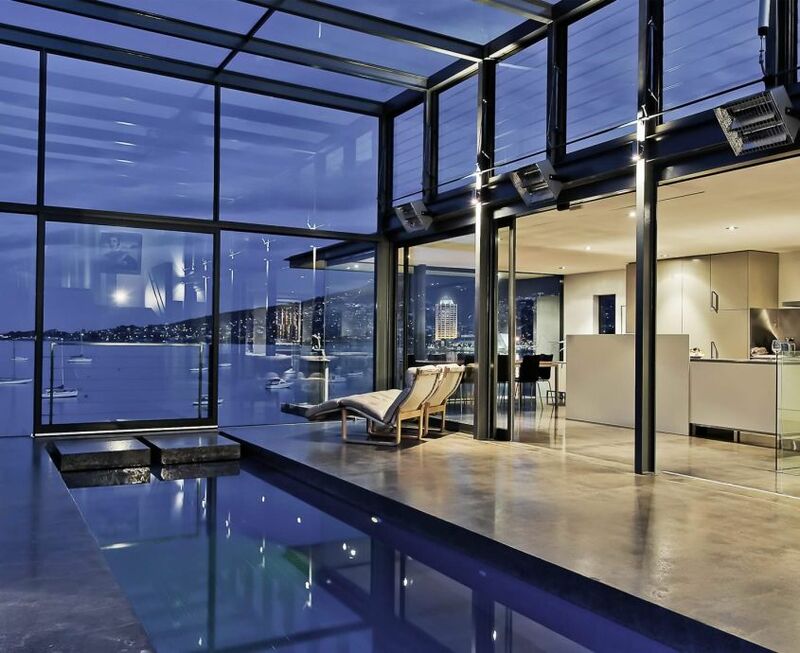 This two-story waterfront residence features large glass walls and an indoor lap pool. 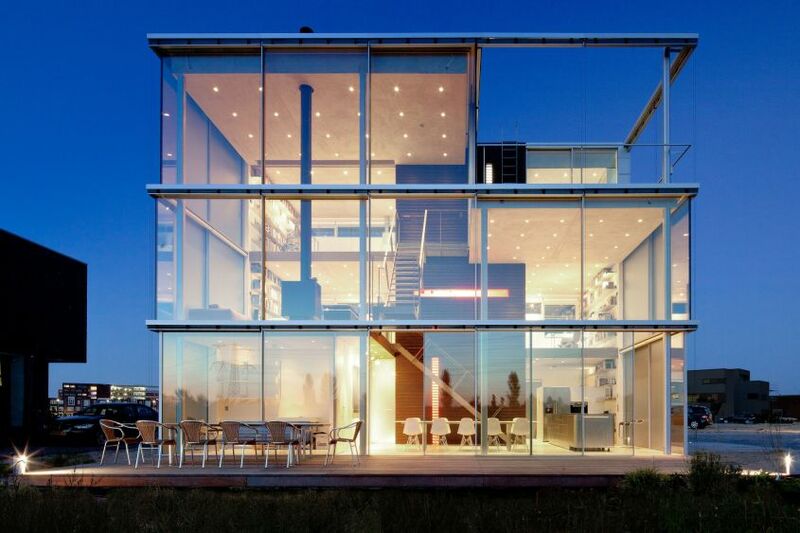 The smooth glass facade blurs the boundaries between interior space and outdoors without sacrificing great aesthetics. 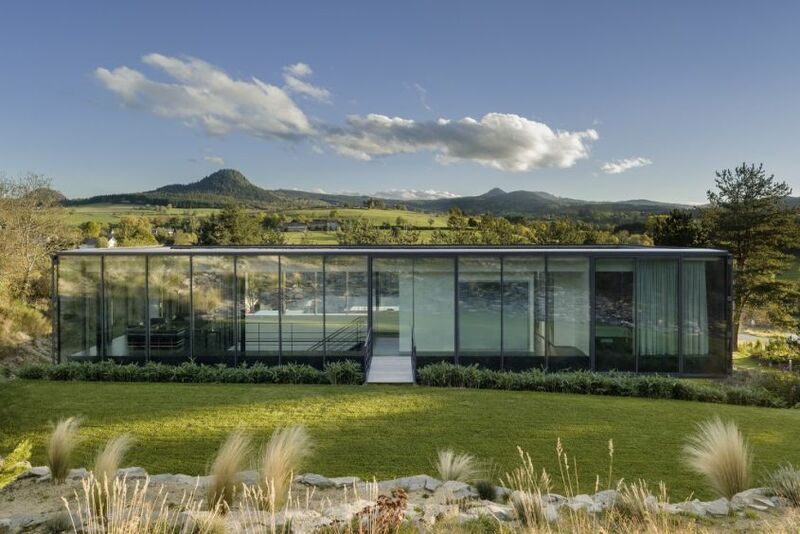 The light-filled living spaces frame great views around the Derwent River. 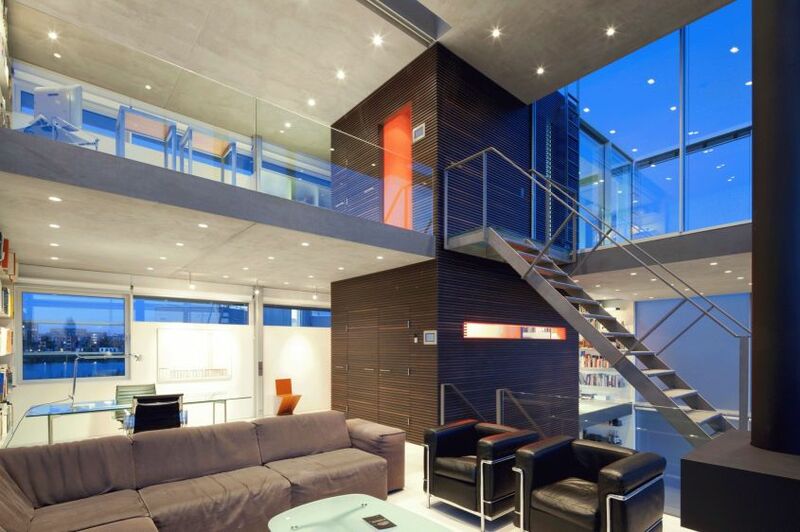 It is a great example of adding glass extension to an existing housing structure. 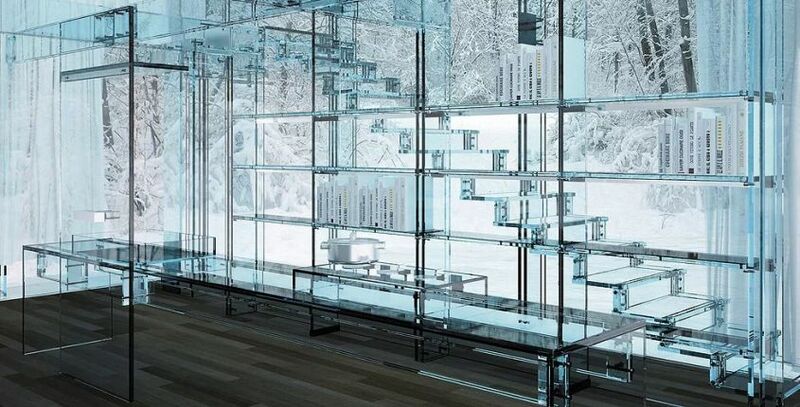 This floating glass structure supported by thin steel columns was created by Japanese architect Kengo Kuma as an addition to the existing mid-century modern home. The L-shaped floor plan and flat roof aim to blend the architecture with environment and create a strong contemporary look. 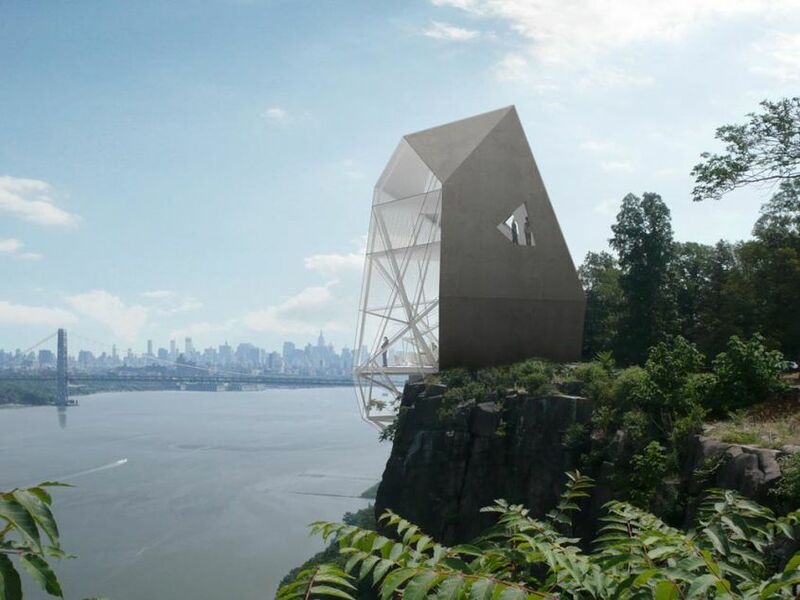 Leading architecture and interior design firm Axis Mundi proposed this riverside cliff house to be built across the Hudson River in New Jersey. The main building materials are concrete, anodized aluminum panels, and seamed glass. It has living spaces including kitchen, dining and living room on the entrance level and bedrooms accessed by a floating stairway on the upper floors. 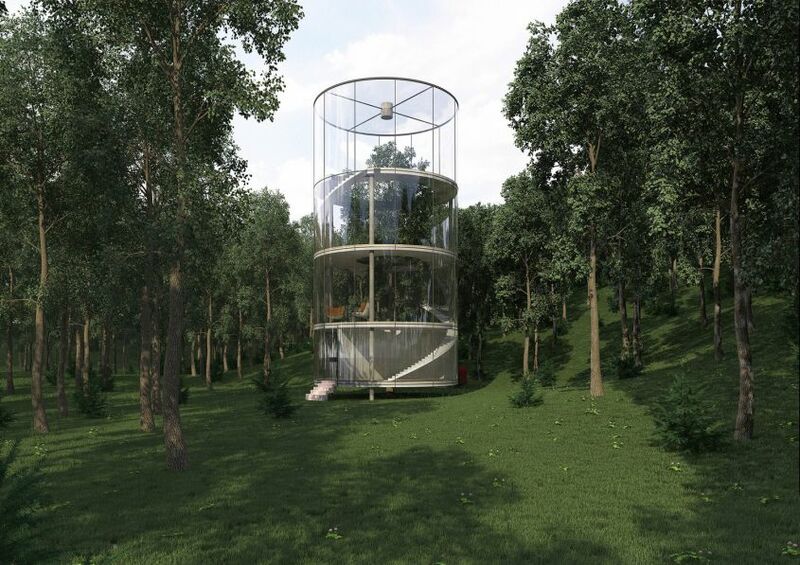 This conceptual tubular glass house was designed to be built around a living tree. 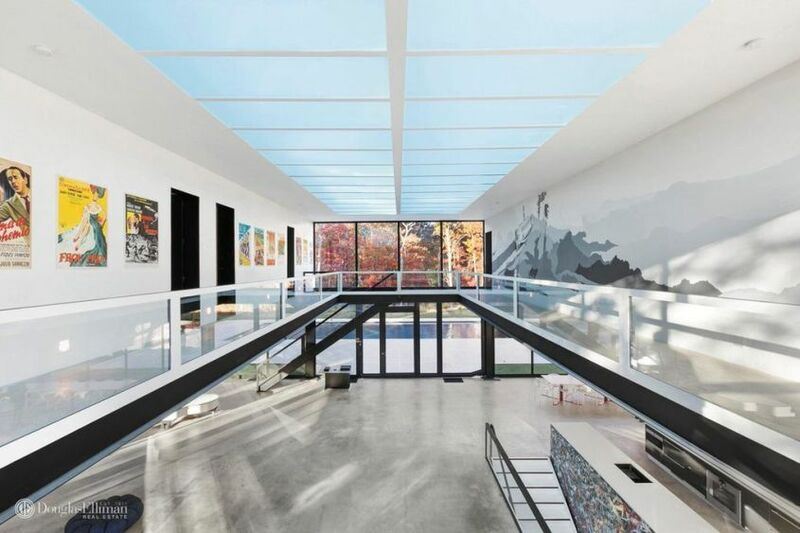 There are a total of four floors, with the top level featuring a transparent ceiling. 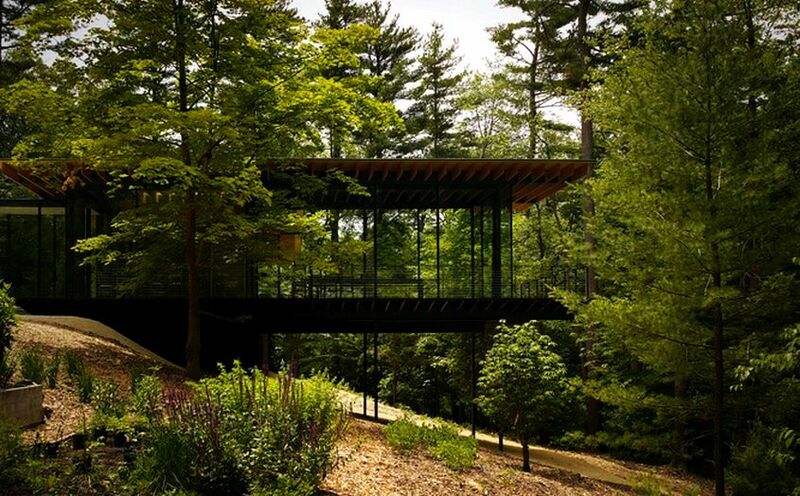 The glass walls make it a great viewing platform for the surrounding forest. 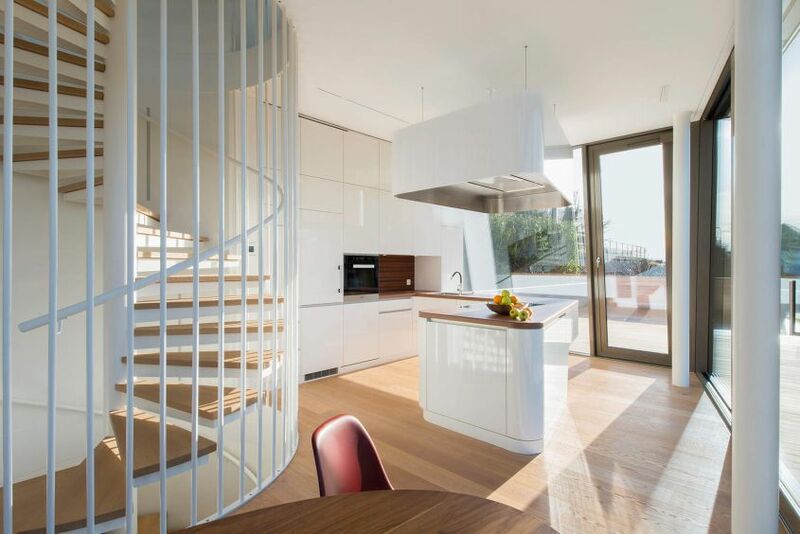 A spiral staircase connects all the floors. 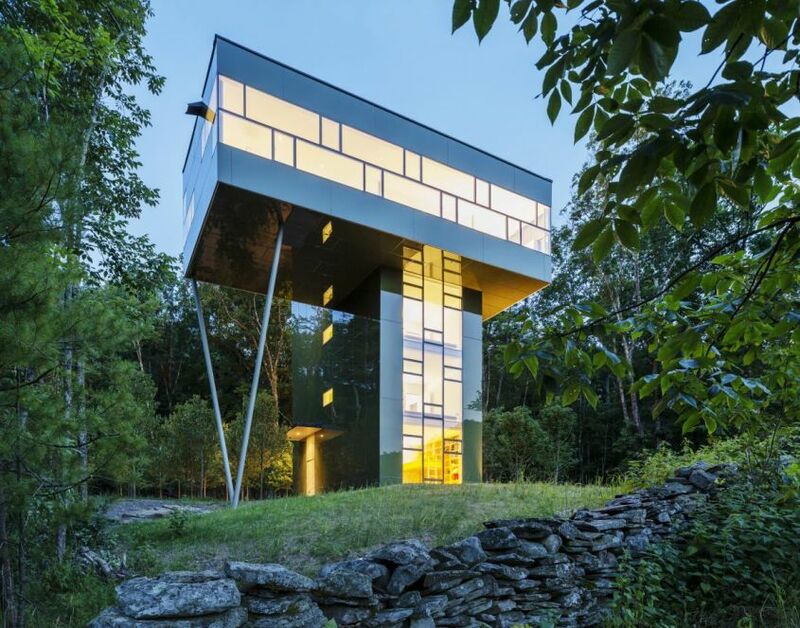 It stands on tiny stilts to lower the impact on the landscape. Also, there are solar panels and rainwater harvesting features to improve sustainability. 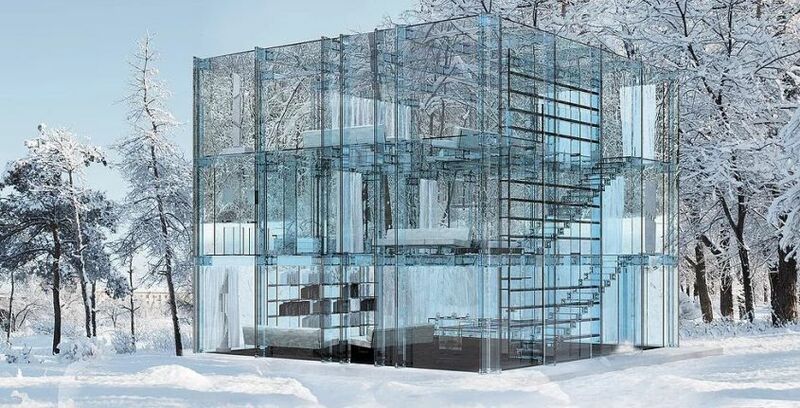 This glass house is built from several sheets of glass assembled using the Plexiglas joint. From walls and ceiling to staircase and furniture items, all living spaces are outfitted with glass items. 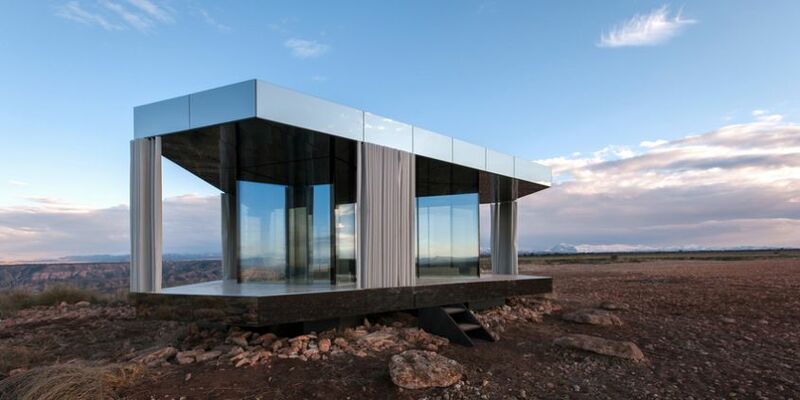 The entire glass structure reflects surrounding terrain while also offering panoramic surrounding views.